A few years ago, Denver hosted the Women’s US Open in Golf. Nancy and I went to see it on the final round. While watching women play golf at the highest level, it dawned on me that women seem to use a different strategy than men. Let’s say a man puts his drive onto the rough. It the grass is a bit high, I’ve seen men attempt to power their shot through the grass thinking they can still reach the green on their approach shot. Sometimes it works, often times it leads to disaster. Women golfers with their ball in a similar location will not even attempt to power their way through the rough. 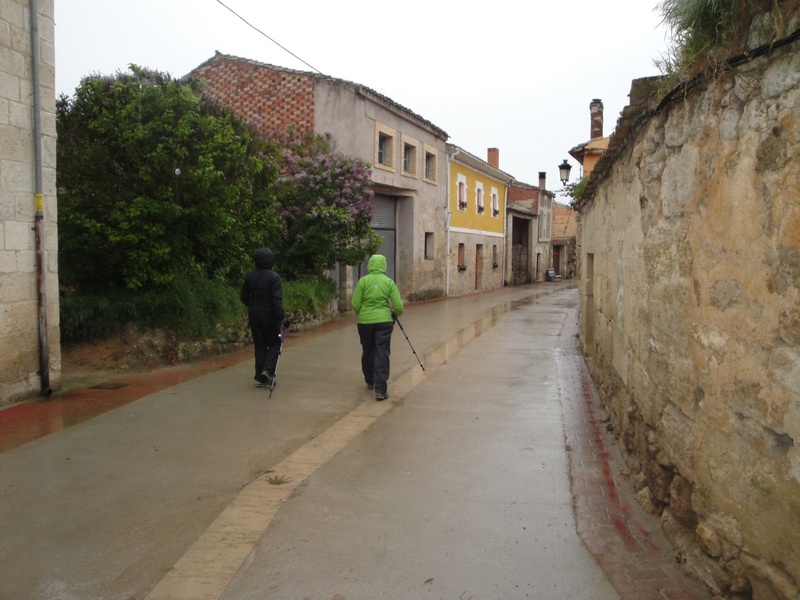 Instead, they simply put the ball back on the fairway and then make a great shot to the green…..
On day two of our Camino, we walked 19.5 kilometers through a steady, cold breeze with rain. The temperature in the high 30’s to early 40’s Fahrenheit. It was a miserable day of hiking. Nancy was complaining of her knee and Andrea of her hip. We reached Hontanas by 1330 in the afternoon but they were done for the day. I was getting frustrated thinking that they were going to “slow me down.” I wanted to slog through. I wanted to power my way through the rough. I was thinking men’s golf when I should have been thinking women’s golf. It’s much smarter. We stayed at a very nice alberque in Hontanas, the “El Puntido.” There were 5 bunk beds and one single in our room. The cost was only 5 euros. We had an excellent pilgrim’s meal in the evening for 9 euros each. It was too much food! That’s one thing we’re quickly finding on the Camino. People can eat very well for a very reasonable price as pilgrims. “women’s golf.” I went ahead and booked a private alberque in Itero de la Vega which was 22.5 kilometers away. Granted, that was 3 kilometers further than day 2. However, I also booked a service in which Nancy’s and Andrea’s backpacks were sent to the alberque in Itero de la Vega. That meant they were not carrying anything but their trekking poles. I also made two leisurely stops for cafe con leche and spanish tortillas in Castrojeriz. The strategy worked beautifully. Although they’re sore and aching, the fact that they didn’t have to carry their backpacks plus the private alberque in which the three of us only have our own room and our own beds, made them feel 100 times better. Women’s golf, playing smart. I will attempt to load a few pictures and make another post tomorrow. As for me, my lower back is killing me and my feet and ankles are swollen and killing me. I’m still thinking men’s golf. I’m still trying to power through the rough. I hope I figure this out quickly! Leaving Hontanas Sunday morning in the cold rain. 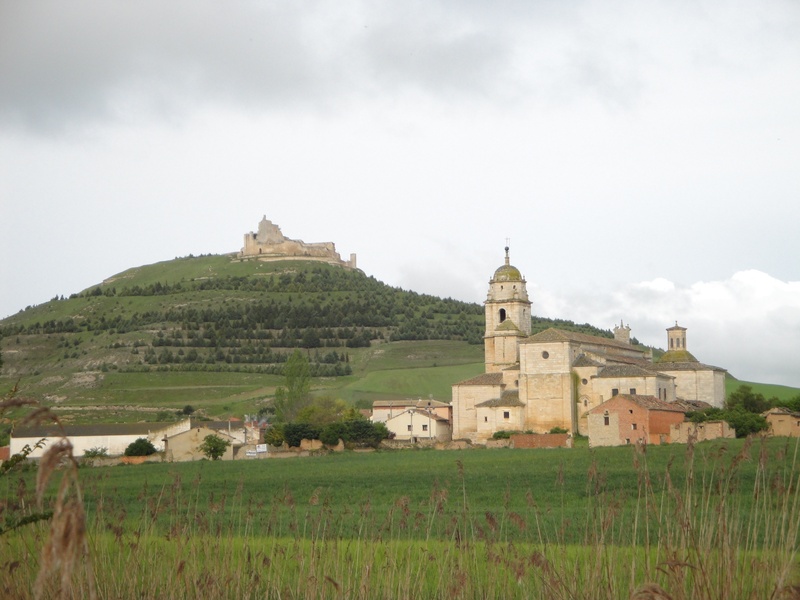 Castrojeriz with it’s castle ruins on top of the hill and old church in the center of town. 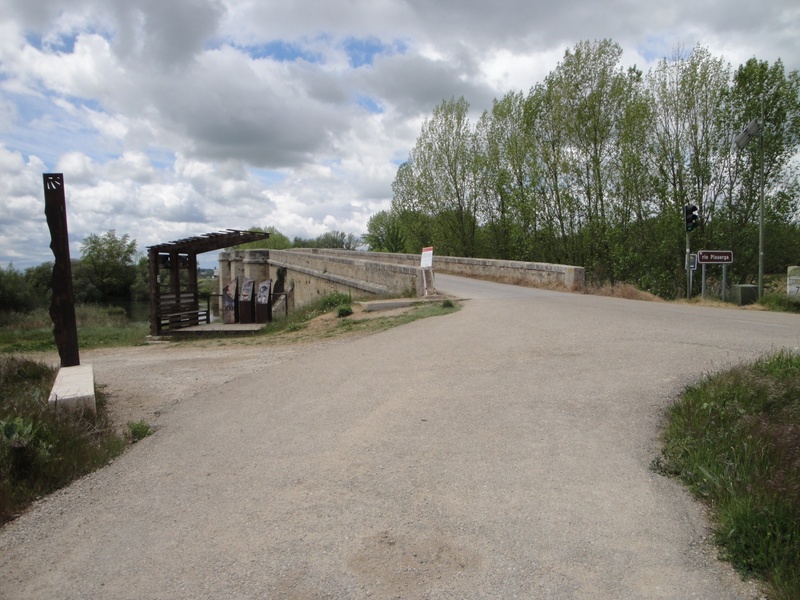 The ancient bridge that allows us to cross the Rio Pisuerga. 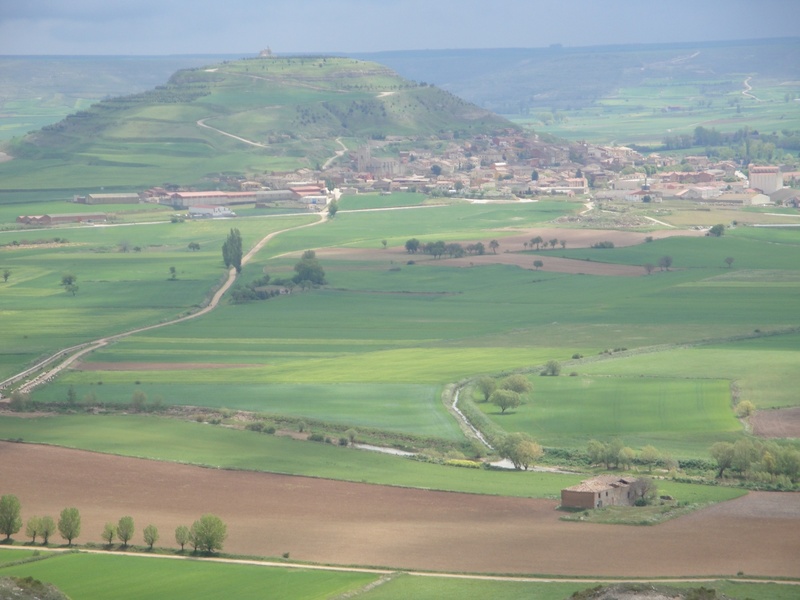 We leave the Province of Burgos and enter the Province of Palencia. I like your strategy Captain. Tell my Nancy to keep her eye on the shell. Nancy here – Glad to hear from you. It lifts our spirits and makes us laugh! I stepped on the snail today so I’m going to follow the yellow arrow and maybe we’ll get there faster! Great stuff Dad! Remember… there is no rush. This is a vacation and time for reflection, not a race. Take your time. Enjoy it! Love you all from Colorado! I know, it’s not a race. We’re building up our walking legs. I think in a day or so we’ll be up to averaging 13 to 14 miles per day. We have plenty of time. We’re enjoying this trip very much! We miss you, Becca and Carmen very much!! Hopefully there will be a nice alberque with a jacuzzi in your near future! Thanks, Jeff! No jacuzzi yet but we’ve stayed in very nice alberques two nights in a row! Maybe one of the advantages of taking it a little easier on your physical bodies is the chance to gain, for each one of you, more time to spend in deeper spiritual reflection in prayer and scripture (maybe individually, maybe together, or maybe a fair bit of both) as you slow down for a time to regroup and rest your weary bones and muscles a bit more. That is my prayer today for your “power trio.” Adios en vaya con dios! Thank you, Bob! The “power trio” is getting stronger each day. Much reflection, prayer and “being in the moment” is making a huge difference! Thanks Joe, I am loving reading these. Can I hire you for our Camino? You seem very caring about your family and wanting them to have the best experience. I also love your golf analogy. Are your wife and daughter documenting their experiences also? Looking forward to reading more! Buen Camino!!! Yes – thank you Joe! I am enjoying every entry you publish. I feel like I’m there with you – love the golf analogy and, as Cayce mentioned, your caring/loving concern for your gals. Sending loving energy to the three of you! Thank you so much, Linda, for your well wishes. It really helps lift our spirits up! Traveling with Nancy and Andrea really changes the dynamics, but for the good!